The New Jersey State Legislature is ready to shut down state government on Sunday, and CWA members are mobilizing to stop it. The legislature's refusal to negotiate will lead to state workers being locked out of work for a second year in a row if there is no agreement by June 30 at midnight. After eight years of Governor Chris Christie, New Jersey needs to rebuild services. Governor Phil Murphy has introduced a budget to do just that. Instead of relying on budget gimmicks and one-shots, Murphy wants to invest in our communities by ensuring millionaires pay their fair share and by closing corporate loopholes. But some New Jersey legislative leaders want to shut down state government or make even more health care and pension cuts to public workers before raising taxes on millionaires. New Jersey needs sustainable, new revenue – not one-shots or cuts that balance the budget on the backs of public workers. Learn more about how you can fight back here. 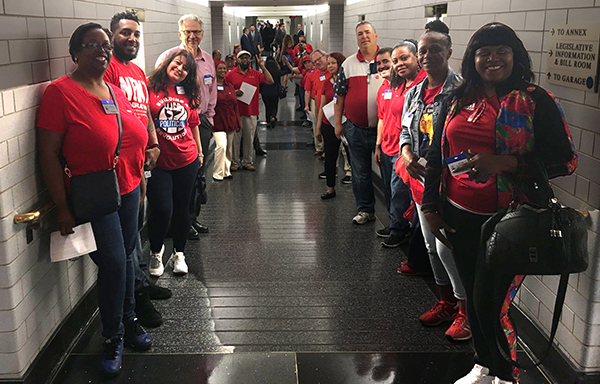 New Jersey CWA members have been hard at work at the Statehouse urging legislators to support Governor Murphy's budget.